In this tutorial, we will walk through the steps to creating your first Red5 Pro Server Application using maven as our build/dependency management tool. In the process you will learn how to create the project structure, configure the application, handle application lifecycle related events, package/deploy as well as test your new application. When the Red5 Pro Server is run, applications are accessible using a web browser from the default port of 5080. If you have the Red5 Pro Server currently running on your machine, you can visit http://localhost:5080 to see the default landing page. The default landing page and any other web accesible applications are stored in the /webapp directory of the Red5 Pro server. In this section, we will be creating a new application to be deployed to this directory. 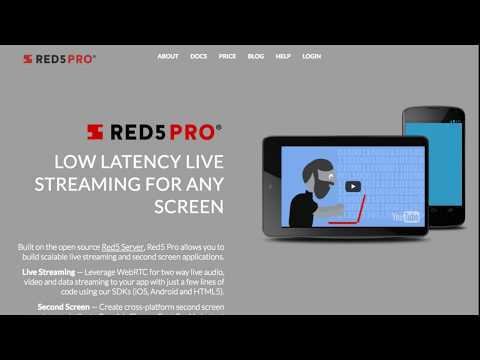 We will utilize the /webapp/live shipped with the Red5 Pro Server distribution and create our first Red5 Pro server application. Add the following three dependencies under the junit dependency. These dependencies add the Servlet and Red5 dependencies which are required for our project to build properly. Click Finish. The java folder will automatically be added as a source folder in your project. We will now add the Red5 Pro context files to our project by locating the live application that is included with the Red5 Pro Server distribution. * Configures a websocket scope for a given application scope. Congratulations! You have just created your first Red5 Pro Server Application! The following sections may aide in troubleshooting any issues may come across in trying the previous examples.